There are a handful of events that stand out as Pennsylvania originals: The Little League World Series, Groundhog Day, and the New Years Mummers Parade. So... it was only natural for me to show up early on January 1st to get a front-and-center seat for what is traditionally known as America’s oldest folk parade. But I’m a rookie when it comes to this experience as the parade lasts over six hours (2008 and before it lasted eleven hours!) which means there was no reason to get there early. Before I get too far ahead, I probably should let you know what a mummer is. Well...in ages past, it was a person who went door-to-door after Christmas, dressed in disguises, to perform skits and songs (much like Bushnickle of the PA Dutch). When people from these traditions immigrated to America (mainly to Philadelphia), the after Christmas elements mixed with the New Year celebration of walking down the street, firing guns in the air (later to be replaced with shouting and fireworks). Ultimately, this turned into a mob (mostly men) dressing up in colorful outfits and painted faces - dancing and strutting down streets - then organizing into different associations and brigades to compete in various parade categories on New Years Day in Philly. My first impression of the event was: WOW! I feel like I’m at a Mardi Gras or something. My second impression was: have most of these people been partying since last night? Both were correct as the parade has the flashy flare (lots of candy and beads) of a New Orleans hoopla, and yep, many of the participants have been drinking since December 31st. If I had to give the parade a MPAA rating, it would be PG-13 as there were open containers everywhere (a police officer I talked with said it causes more trouble taking the drinks away than just letting it be), plenty of public intoxication, a few sexually suggestive skits and costumes, and some questionable practices involving racial stereotypes (I’m trying to give these individuals the benefit of the doubt as I’m not quite positive they knew it was questionable). With that said, there was still a lot of good, wholesome, family fun to be had -- not to mention the multitude of hot pretzel carts being wheeled around (mmm...). The string band division, to me, is the most enjoyable part of the parade. These unique groups have some of the most outlandish costumes, plus they march with instruments that aren’t traditionally easy to carry (i.e. 40 pound double basses and baritone saxophones). I think my favorite aspect of this event is how open and casual the participants, spectators, and even the police are as everyone interacts with everyone. While waiting for their brigade to move forward, three girls from the crowd crossed the barricade to chat with the group’s banjo players - this turned into a small dance party as the girls, banjo players, and a traffic cop all started to dance and jive. Sweet, sweet fun! I also talked with one string band founder who had been marching in the parade for over fifty years. He was extremely excited to have his son, grandson, and now great grandson marching side-by-side with him through the streets of South Philly. It turns out, having multiple generations participate in the festival is a pretty normal thing. One couple, dressed up as a clock and the moon, had their infant dressed as a cow (fastened to the moon) and paused every few seconds to proudly showcase their newborn to the crowds along the boulevard. This kind of thing could be seen throughout the day. Overall, I had a blast and a half! I thoroughly enjoyed myself and would strongly encourage anyone to check out the Mummers Parade. If you can’t be here on New Years Day, be sure to swing by the Mummer Museum on South Second Street. It’ll be worth your while to do so. Happy 2013 Here A Year-ers! Located southwest of Philadelphia (almost to Delaware), Longwood Gardens was originally inhabited by the Lenni Lenape tribe. After Europeans started to settle the New World, William Penn sold this area to the Quaker family Peirce, who farmed the land until they sold it to be developed and preserved by the du Pont family. Almost a million people go through the gardens in an average year to soak in the 1000+ acres of floral and fauna. On New Year’s Eve, the vast majority of you will either be in New York City watching the ball drop or you’ll be watching the Times Square celebration on television. But why not make this tradition even more fun by dropping a wooden cow from a silo or a replica of the world’s largest ‘shoe house’? Well, in Pennsylvania, you can. PA boasts the record for having the most diverse listing of things dropped throughout the state on New Years Eve. A 100+ pound stick of Lebanon Bologna is dropped. 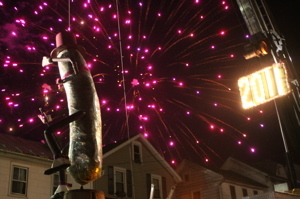 The owner of Lebanon Bologna is Godshall's Quality Meats who donates the giant meat stick for the festivity, which is encased in a frame and suspended from a fire department ladder truck. When the celebration is over, the bologna is donated to a local rescue mission. A yellow illuminated Peep made out of fiberglass is dropped. This heavenly display of yumminess weighs in at 85 pounds and measures 4½ feet tall, 5 feet wide, and 6 feet long. The marshmallow treat was born in Bethlehem and is still manufactured there today - talk about a going into the new year with a sugar hangover! Two pickles are dropped, one at midnight UTC (known to the locals as ‘Mrs. Pickle) and the other at midnight EST. The two pickles have progressed through life together as their story evolves year after year. In 2011, the Mrs. was pregnant, which means we might be on the lookout for a third pickle drop in 2012. A stuffed goat is dropped. This small community in the shadows of the Three Mile Island power plant, has an annual goat racing day in September. The dropping of a stuffed goat is in honor of their fall tradition. -Allentown: A Liberty Bell replica is dropped to commemorate when the original was stored in Allentown during the Revolutionary War. -Akron: A shoe is dropped. -Beavertown: A beaver is dropped. -Blain: A wooden cow is dropped from a silo. -Bradford: A ball is dropped. -Carlisle: An Indy car is dropped. -Cleona: A pretzel is raised. -Cornwall: A Cannonball Drop commemorates the historic Cornwall Iron Furnace. -Duncannon: A sled is dropped. -Easton: A ten-foot Crayola crayon is dropped at 8pm to accommodate children's bedtimes. -Elizabethtown: A giant M&M is dropped at midnight UTC to correspond with its sister city in Ireland. -Frogtown: A frog is dropped. -Gratz: A wildcat is dropped. -Halifax: A Hemlock tree is dropped. -Hallam: A replica of the Haines Shoe House is dropped. -Harrisburg: A strawberry is dropped. -Hershey: A Hershey Kiss replica is raised. -Hummelstown: A lollipop is dropped. -Ickesburg: A french fry is dropped. -Lancaster: A red rose is raised. -Lewistown: A bag of Hartley's potato chips is dropped. -Lititz: A Moravian star is raised. -Liverpool: A canal boat is dropped. -Manheim: A ball is raised. -McClure: A kettle is dropped in honor of the Bean Soup Festival. -Mechanicsburg: A wrench is dropped. -Middletown: A metal Rhombicuboctahedron is dropped. -New Bloomfield: A box huckleberry is dropped. -New Oxford: An antique trunk is dropped. -Newville: A big spring is dropped. -Palmyra: "The Giant Shoe" is dropped. -Pittsburgh: A ball representing Earth, made of recycled materials, is raised. -Philadelphia: A ball is dropped. -Port Royal: A sprint car is dropped. -Pottsville: A bottle of Yuengling beer is raised. -Red Lion: A wooden cigar held by a lion is raised. -Richland: A cigar is dropped. -Shippensburg: An anchor is dropped. -Strasburg: Ping pong balls are dropped. -Shamokin: Coal dropped, turned into a diamond at the bottom. -Wilkes-Barre: Coal dropped,turned into a diamond at the bottom. -York: A white rose is dropped. It’s hard to escape the Pennsylvania Dutch influence during the holiday season as many of the modern day traditions evolved from their traditions. For instance, the central symbol of modern American Christmas’ is a decorated tree. And while the Puritans in Massachusetts were able to ban the actual celebration of Christmas, along with all of the (so called) pagan rituals associated with it, the Pennsylvania Amish, Quakers, Mennonites, and Friends faiths kept their homeland traditions going -- like the Christmas Tree. Traditionally, they would cut off a limb of a cherry tree on December 4th (St. Barbara’s Day) and would decorate it with candies, nuts, and fruit - hoping for the buds to blossom on Christmas Day. Also, the children would place an empty plate under the tree hoping for the Grishkindel, or Christ-child to leave them treats. Belsnickel - Covered head-to-toe in furs and usually wearing a mask, Belsnickel's "mission" was to punish naughty children. You could say he was Santa’s opposite, but really, he was there to scare the children into doing good. Sometimes, Belsnickel would appear weeks ahead of the holiday in the windows of the house and would tap a switch on the pane to frighten the children inside. During Second Christmas (see next item), Belsnickel would appear carrying a bag filled with bells, nuts, and candy as he went door-to-door, again, hitting the windows along the way. The children would then open the door and Belsnickel would throw candy and treats onto the floor and slap the hands of the kids who were trying to pick up the sweets. There are lots of story twists to Belsnickel character, but most involve him punishing children. Dwight Schrute from NBC’s The Office, portrayed Belsnickel in their latest Christmas episode. Second Christmas - While most people who celebrate Christmas do so on the Eve (24th) or the Day (25th), the Pennsylvania Dutch reserve the day after (26th), not for returning gifts, but parties, egg dying (what most people do at Easter), and Belsnickling (going around with Belsnickel to deliver treats). Some traditions actually use this day to pull pranks on each other (like April Fools Day). Sounds like a great idea to me! BTW...I’d love to hear about your traditions in the comments.